Northern Coalfields Limited Recruitment 2018 Central Govt Nursing Jobs Northern Coalfields Limited, Madya Pradesh, A Government Under Taking Company Inviting Applications for Staff Nurse, CT Scan Technician, MRI Technician On Regular Basis Interested Candidates can Apply through On-line. Candidates who are Searching for Government Nursing Vacancies,Central govt Nursing Jobs, Latest Staff Nurse Jobs, Staff Nurse Jobs in Madya Pradesh, Madya Pradesh Govt Nursing Jobs, can Apply fir this NCL Recruitment 2018. Get Various Vacancy details, Jobs Description, Number of Vacancies, Maximum Age limit,Pay Scale for Month, Details Eligibility qualification, Educational qualifications,Desirable qualification, Mode of apply Time and Date of the registration,Walk in Interview,Information about Northern Coalfields Limited Recruitment 2018 Central Govt Nursing Jobs details given below. Educational Qualification:-Pass SSC, Intermediate and Diploma in General Nursing Midwifery or Bachelor Degree in Nursing from a Government Recognised Institution or university and Candidates should be registered in Indian Nursing Council or State Nursing Council. Age Limited:-Age Should Not Exceed 30years as On Last Date That is 12th November 2018. Last Date for Printed Copy Submission:-12th December 2018. 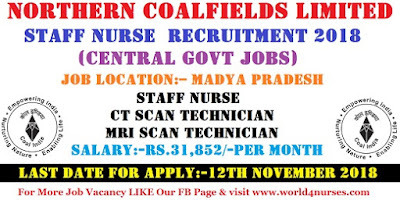 Address for On-line Hard Copy Submission:-To Recruitment or Manpower Department Northern Coalfields Limited,Head Quarters through Speed Post or registered Post.Interested Candidates Who Ful fill the Above Qualification can Apply On-line by the Link Given.Get More Information about Northern Coalfields Limited Recruitment 2018 Central Govt Nursing Jobs and Official Notification Download.